Cantie Saunt Dandie’s Day tae ye! Horse? Check. Hound? Check. Hawk? Check. Bow and arrow? Check. Dagger? Check. Castle? Check. Dragon? Check. A quick draft of an idea I had for the cover art. I thought I’d share a picture of the princess at her most outdoorsy. She certainly looks like she’s ready to go hunting, as much as a fairy tale princess ever does, of course. I think her hair would be a problem in real life, though. 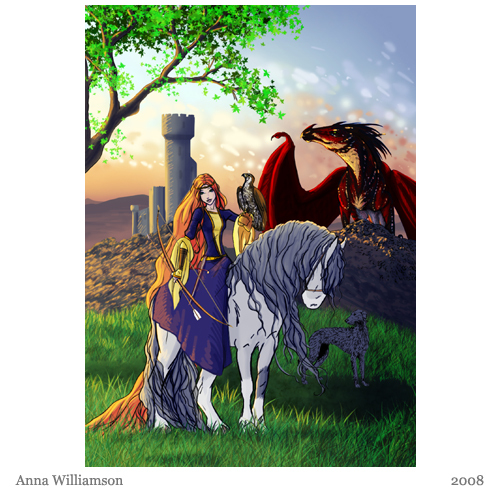 I LOVE love LOVE the horse, the dog, the hair, the dragon, the princess, the dress, the background, the grass and tree and the colors!!! And you know I sincerely mean it!! !